When you go to see a doctor, you are trusting them to do everything they can to help you as well as follow a standard level of care. However, sometimes that trust is betrayed and you end up being in worse condition than you were before. When your worsening health is due to the negligence of the doctor, there is a serious case to be had. If you think your injuries are the cause of medical malpractice, call The JW Law Firm to meet with one of our lawyers. You shouldn’t have to suffer because of a doctor’s negligence, and if you are, you deserve compensation. 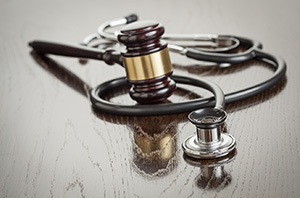 Medical malpractice is determined when a healthcare provider’s method of treatment falls below the accepted “standard of care” and causes injuries or death to the patient. For us to claim malpractice, we have to demonstrate that the doctor, nurse, or hospital was negligent in some way and that your injuries are a direct cause of that negligence. All medical professionals have a duty to provide their patients with a certain level of care, so as to prevent harm. But when that duty is breached and their patient is injured directly because of it, an investigation to prove medical malpractice should take place. Patients that suffer damages due to their injuries have the right to seek compensation. To figure out the total damages, we work with medical experts to determine how long you are likely to suffer or be debilitated by your injuries and how much that is going to cost you. We then look at what it will take for you to live with your injuries while you’re in the rehabilitation process. We also consider the less tangible things that your injuries have taken from you, i.e. loss of personal enjoyment, and the psychological pain that it can cause. Once everything has been accounted for, we can then deliver your claim to the defending party and negotiations begin. During this time, we will do our best to get you the fair and just amount. If we cannot reach an agreement that satisfies what you deserve, we will take your case to trial and let either a judge or jury make the final ruling. If you’ve suffered injuries because of a healthcare provider’s negligence, call The JW Law Firm. We promise to fight for you until the very end and make sure that you receive what you are owed.